Field edge of experimental plot of Japanese knotweed. Research funded by the UK Government has identified that cultivated Japanese knotweed is a highly effective and natural system for reversing the effects of climate change via phytological carbon sequestration. At current fossil fuel consumption rates the UK will fail to meet its challenging international and domestic carbon reduction targets. A large scale switch to renewable energy is not, realistically, on the cards and will not, therefore, be the panacea some think it might be. The most optimistic projections see the UK hedging its bets on natural gas, which is the cleanest of the fossil fuels, to satisfy energy demands until low carbon and renewable technologies take over. However, natural gas can only ever be a stop-gap towards a low-carbon economy as, although relatively free of contaminants, burning it releases atmospheric carbon that would otherwise be safely locked up in the planet’s geology. Current predictions indicate that we have just 10 years before the natural gas ‘stop-gap’ becomes an overflowing, irreversible haemorrhage of CO2 into the earth’s atmosphere. However, if we use this stop-gap to get our act together in developing Carbon Capture and Storage technologies to buffer and ultimately reverse carbon emissions, the ‘climate change’ future looks much more manageable. This is where phytological carbon sequestration technologies come in. Natural gas can continue to be an efficient, clean source of energy, if the geological carbon can again be locked up or circulated in the carbon cycle. Plants actively absorb CO2 and convert it into biomass. Therefore, planting large numbers of a species with particularly high rates of photosynthesis will result in potentially massive sequestering of carbon from the atmosphere. Japanese knotweed’s incredibly vigorous growth rate and invasive nature makes it a very hungry plant. It can absorb CO2 at a rate unmatched by most other plant species. It is on the basis of these facts that the UK Government, through the Biomass Energy Research Council, has initiated field trials at three sites near Liverpool. Preliminary results show that carbon sequestration rates in fields of Japanese knotweed could extend the natural gas ‘stop-gap’ so that gas-fired power stations could balance their CO2 emissions to a net emission rate of zero. Current data suggest that as little as 1 hectare of knotweed per 50Megawatts of thermal output would be needed to effectively sequester a power station’s CO2 emissions. Obviously, many hectares of knotweed would still be needed to sequester the total CO2 emitted at today’s energy consumption rates. But as the UK is increasingly producing less food, many hundreds of farms across the country could be diverted from agriculture to phytological sequestration. 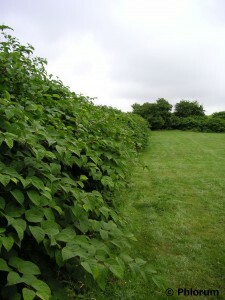 There are some concerns that fields of knotweed could compromise the security of native biodiversity. However, as companies like Phlorum continue to add to the understanding of how to effectively manage this invasive weed, such problems are considered manageable. The research is ongoing, but the results are already extremely promising.